Mid American Pompon’s reputation for quality events is outstanding. Ask any of the participants, coaches or parents who attend our events – our events are organized, they run on time and are always of the highest quality. What does your team want from summer camp? 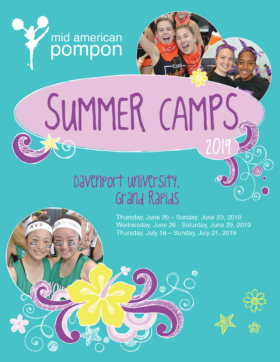 Mid American Pompon Camp from Zara Creative on Vimeo. Summer camp is a great way for teams to start the year with fresh routines, team bonding, and memories to last a lifetime. Mid American Pompon takes pride in having the best staff as well as offering the most entertaining and exciting routines for our campers and coaches. Mid American Pompon has it all!! Write-up booklet including formations & count by count routine breakdown. We’ll see you and your team this summer!